The coming of the digital dimension in the world of children literature, and specifically in the one of picture books, questions the experiences the book is read, used, promoted with. Transbook – Children’s Literature on the Moveis a project that studies these transformations, and in particular those involving the role of narrators through images. How does the role of the illustrator change when challenged by new digital “spaces”? How did the artistic activity change in the switch from paper to digital supports? For the occasion of Bologna Children’s Book Fair 2017, a series of talks dedicated to the exchange of experiences and reflections with some professionals of the illustration world will try to answer these questions. This series of talks is promoted by Transbook – Children’s Literature on the Move, co-funded by the Creative Europe programme of the European Union. Round table with Sylvie Vassallo, head of Salon du Livre et de la Presse Jeunesse di Montreuil and of Transbook – Children’s Literature on the Move, Sophie Van der Linden, picture book expert, Aksel Køie, from Step In Books, and the authors Vincent Godeau and Agathe Demois, special mention at the Bologna Digital Award 2018 with Cache-Cache Ville/Hide & Seek City (Seuil Jeunesse). 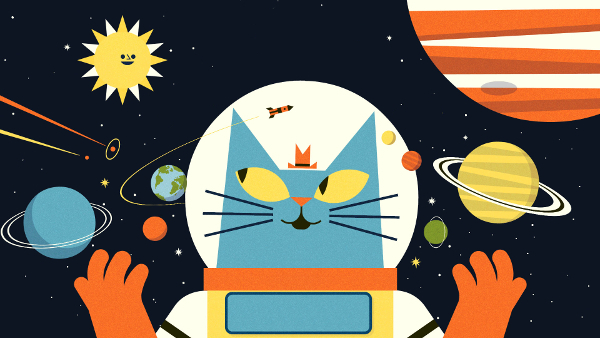 Ben Newman, English illustrator, will bring us behind the stage of his book Professor Astro Cat and its digital incarnation. Nadia Budde is a German illustrator, best known for her picture books. Last year, her book Eins, Zwei, Drei, Tier turned into an app. The author will discuss how technology changed the book and her work method. Frédéric Gauthier, founder and editor of La Pastèque, one of Québec’s most important comic book and picture book publishers, introduces Tout garni, a project born to celebrate the 20th anniversary of his publishing house. Tout garni is a collection of webcomics made by La Pastèque’s authors. All episodes are linked, but each one of them uses a different approach to storytelling and different techniques: from videogames to augmented reality, from 360° exploration to infinite canvas. Supported by Transbook Children’s Literature on the Move, co-financed by the Creative Europe project of the European Union. Transbook is a European project co-funded by the Creative Europe Programme 2014/2020 of the European Union, coordinated by Salon du livre et de la presse jeunesse (France) in partnership with Hamelin Associazione Culturale (Italy), Europäische Kinder- und Jugendbuchmesse Saarbrücken (Germany), Tantàgora (Spain), Arts Basics for Children (Belgium), Nobrow Ltd (UK) e Literárne informačné centrum (Slovakia).